Wed, Mar 13 2019 6:56 AM by Kenher01. 54 replies. young46 has a YouTube video showing how to get and install an Autohotkey program that creates a 6 inch ruler you can move around on the game screen to measure the amount of the calculated wind drift. It requires a download of 3 files that create the ruler and the download of the Autohotkey program. I downloaded the 3 files to a folder and downloaded and installed the Autohotkey program. I can't get it to work. There has to be a way to tell Autohotkey the files I want it to use. "Before AutoHotkey can do anything, you need to write a script telling it what to do. To learn how, read the tutorial or dive straight in." I can't figure it out. If I right click the ruler.ahk (autohotkey) file and tell it to open with Autohotkey program I get a script error. 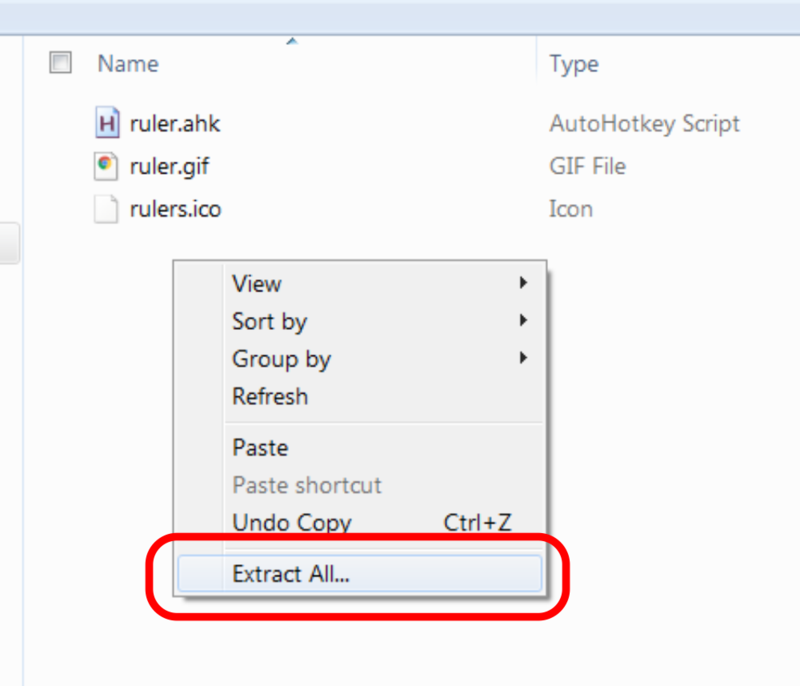 Curtis, while viewing the three ruler files in windows explorer, if you right click in the window (not on any of the three files) and you get an 'extract all' option in the menu, click that. Then in the new window that opens, double click the ruler.ahk file and that should make the ruler appear for you. Be careful with this angle. This is one of those cases where any old ruler won't do. Young's ruler is very specific in its size and configuration. i.e. 10 cm (or Inches, or increments) on the ruler exactly matches the width of the aimer box. If you downloaded a ruler and used it blindly without taking that into account you could be aiming more/less than you think you are. I've never used Auto HotKey before so I don't know if it's compatible with Win XP Pro. What happens when you double click the ruler.ahk file? You might need to assign a key to the program to make it execute. on the last line, if you then press ctrl plus x at the same time the program will close. Good luck - you can do anything if you know how. Using the AHK ruler means that you don't have to conceal the fact that you are running AHK, and this is dastardly cunning ;-) you see anybody who is even slightly familiar with AHK knows it is verrrrrrrry versatile - you could probably convert your PC in to a coffee vending machine with it!!! You can trigger things based on time, you can even trigger things based upon the colour changes on your screen!!! (think about that one) - go look on their forums. A number of them use the AHK ruler on here ........so now they don't have to conceal that little green icon....I'M USING THE AHK RULER LOOK BOYS, THE AHK RULER I'M USING IT, LOOOOOK!!!!!! ....and whatever else - peek-a-boooooo I see youuuuuuuuuu, lolololos!!!! I did wonder why I couldn't hear the mouse click go off on the bottom of your swing the other day when, on occasion you slightly missed the ding - and there is nothing to mask an audible mouse click - especially when you are watching with your volume set up very high and every other mouse click was very very audible indeed, yet rarely was it heard at the bottom of your swing. The only time I heard it go off on the bottom of your swing you missed an absolute pearler - about 4.5 foot putt on Congressional no. 17 - that's when I knew!!!! (anybody in the top bracket who is using an on-screen ruler THAT JUST SO HAPPENS TO BE AN AHK ONE should set red alarm bells ringing like a torpedoed submarine throughout the entire community - I mean if you weren't running anything other than a ruler, then you just wouldn't be so stupid to make it an AHK one with so many different varieties to choose from out there). Young46 has a tube vid somewhere showing and telling what to open and how to adjust the size! When I do that, it opens the ruler and displays it (WIN 10). I think that is all I had to do after extraction. BTW - you can toggle the ruler display on/off with the F1 function key - which is defined in the script.